Aim: To establish the incidence, time course, and severity of conjunctival wound leakage following trabeculectomy, and also to establish whether early wound leakage adversely affects the ultimate outcome of the surgery. Method: A prospective, observational case series of sequential trabeculectomies performed in a single institution over a 12 month period. Datasets on 286 operations were analysed. A fornix based conjunctival flap was used in 254 cases and a limbus based conjunctival flap in 41 cases. At every postoperative visit trabeculectomies were assessed for four grades of leakage (none; mild; moderate; severe), and for success or failure at the 6 month follow up post surgery. Pressure was applied to the trabeculectomy bleb to record the maximum rates of leakage and improve kappa statistics. Study clinicians were validated with respect to their scoring of leaks before starting the study. Results: 169 of the 286 trabeculectomies (59%) showed leakage at some stage postoperatively. 159 of 245 fornix based flaps (65%) leaked compared with 10 of 41 limbus based flaps (24%). Median time to leak was 3.5 (range 0–408) days. Median duration of leakage was 14 (range 2–457) days. 14 (5%) of trabeculectomies failed completely. A further 40 (14%) were a partial failure. In total, 23 of 117 (20%) without postoperative leaks partially or completely failed compared with 31 of 169 (18%) with leaks. Cross tabulation of partial and complete failure by leak shows no evidence of an adverse effect of leaking on the outcome (χ2 = 1.81, p = 0.4). Conclusions: There is no evidence to support the hypothesis that early postoperative leakage of fornix based conjunctival flaps affects the outcome of trabeculectomy. A prospective study was designed to establish the incidence, time course, and severity of conjunctival wound leakage following trabeculectomy, and also to establish whether early wound leakage adversely affects the ultimate outcome of the surgery. A prospective, observational cohort study was performed assessing sequential trabeculectomies for leakage postoperatively. Over a period of one year, every patient who underwent trabeculectomy in the glaucoma unit of a single institution was graded during every outpatient visit into one of four categories of leak from their conjunctival wound. The assessments were recorded on sheets of paper collected at the end of each clinic. The endpoint for success or failure was at the 6 month follow up after surgery. Success was defined as an intraocular pressure (IOP) less than 20 mm Hg with no treatment. Partial failure was defined as an IOP controlled at less than 20 mm Hg with topical medication. Complete failure was defined as an IOP greater than 20 mm Hg. Before starting the study, clinicians involved in assessing the eyes postoperatively were validated with respect to their scoring of leaks. Kappa statistics of between 0.51 and 0.85 were obtained (weighted kappas 0.88–0.96) between clinicians for four grades of leak: no leak, mild leak, moderate leak, severe leak. Where unsatisfactory kappa statistics were obtained for any particular clinician, the most common reason was lack of pressure on the bleb to record “maximum” leaks. Without this pressure their results were much less consistent. This means that the recorded prevalence of postoperative leakage is a maximum in this study. Data sets on 286 operations were analysed, 79 trabeculectomies, 183 trabeculectomies with cytotoxic application at the time of surgery, and 24 more complex procedures. Fifty four individuals underwent surgery on both eyes. A fornix based conjunctival flap was used in 245 cases and a limbus based conjunctival flap in 41 cases. iSTATA version 7.0 (StataCorp, College Station, TX, USA) was used for statistical analysis. Although the data on leaks were collected prospectively at the end of each clinic visit, the outcome for each subject was determined retrospectively by note recall and review. This enabled uniform review and application of outcome criteria but suffered from difficulties with note retrieval. An initial review yielded only 46% of notes for outcome determination in those eligible by virtue of complete information with respect to bleb leakage. In an attempt to assess if there was bias in the sample obtained, a concentrated effort was made to review all cases performed from September to December 1993. For these months the proportion reviewed was increased to 96% of those eligible. A comparison of those missed at the first review with those seen at the first review showed no major difference in proportion of operative failures (χ2 = 2.7, p = 0.3) or conjunctival leaks (χ2 = 0.3, p = 0.6). Because substantial effort went into this further validation and as there was no suggestion of bias in the sample obtained, we analysed the dataset with a total of 286 operations. This represents 61% of eligible operations performed during the 12 month period. Mean follow up was 353 (standard deviation, 196) days, the median was 323 days. The operations that were performed and the per cent found to have a conjunctival aqueous leak to some degree are shown in table 1. A cross tabulation of partial and complete failure by leak shows no evidence of an adverse effect of leaking on the outcome (table 2). Result of trabeculectomy by presence or absence of conjunctival leakage of aqueous humour. For the purposes of further analysis, partial failure and complete failure were combined as failure, and logistic regression analysis performed to investigate potential risk factors for failure and determine whether confounding by other factors could be concealing an association between leakage and failure. In addition, because mild leaks were induced and may not be considered clinically in the same league as moderate or severe leaks, regression analysis was performed combining no leak with mild leak, and moderate with severe leak. Analysis was tried using all four categories of leak. In all cases the results were similar, and those for the simplest model of two categories of leak are given. Table 3 shows the crude and adjusted odds of failure of the operation according to various risk factors (leakage scored as present if moderate or severe only). Correlation between results for two eyes of the same individual is always possible, resulting in interaction. The analysis was repeated using right eyes only of those with two eyes included in the dataset. This gave virtually identical results but with wider 95% confidence intervals. The only result of note was that for a past history of topical adrenaline use, which developed an adapted odds ratio of 3.20 (95% CI 0.78–13.2) for trabeculectomy failure. Concordance of results between right and left eyes for the 54 individuals with bilateral operations in the dataset was no different from that expected by chance for leak, but shows concordance for failure (table 4). Table 5 shows the leakage rate according to limbus or fornix based conjunctival flaps. The median time to leak was 3.5 days with a range from the first postoperative day to 408 days postoperatively. Figure 1 illustrates the distribution of time to leak (defined as occurring halfway between a review with no leak and the first review with a leak observed). Figure 2 illustrates the duration of leakage calculated from halfway between the onset of leak as defined above, and the stop of leakage halfway between the last review with a leak and the next review without a leak. The median duration of leak was 14 (range 2–457) days. Seven eyes had leaks lasting longer than 100 days. Of these one was a limbus based flap; the leak eventually sealed spontaneously however this operation failed. Four of the remaining six fornix based conjunctival flap operations with prolonged leaks sealed spontaneously. The remaining two were taken back to theatre after more than a year of leakage and underwent successful bleb reconstruction. Histogram of time until leak in eyes which leaked. 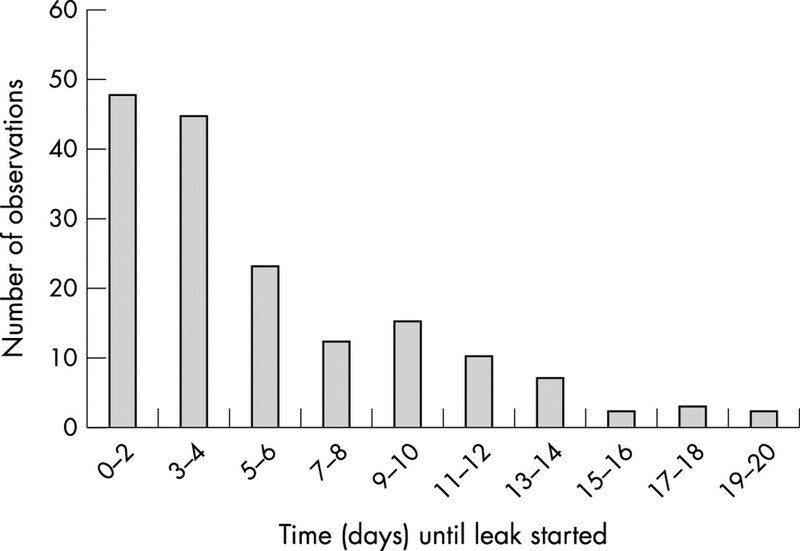 Histogram of duration of leak in eyes which leaked. This study shows a high rate of postoperative trabeculectomy leaks; 169 of the 286 trabeculectomies showed leakage at some stage postoperatively (59%). Of the 245 fornix based flaps 159 (65%) and 10 of the 41 limbus based flaps (24%) leaked at some stage postoperatively. Ng et al observed that the harder one looks for a leakage site, the more likely one is to find it.8 In this study, when assessing the trabeculectomy bleb for leak, the clinicians applied pressure to the conjunctiva in order to increase the consistency of results and increase kappa statistics for assessment. As a result the rates of leakage are a maximum. The rates of moderate or severe leakage are lower: 27% of all trabeculectomies, 29% of fornix based trabeculectomies, and 12% of limbus based trabeculectomies. This is more in line with other studies. Cross tabulation of partial and complete failure by leak showed no evidence of an adverse effect of leaking on the outcome. Because mild leaks were often induced by the clinicians, analysis was tried using all four categories of leak, and combining no leak with mild lead and moderate leak with severe leak. In all cases the results were similar. Although studies of limbus versus fornix based conjunctival flap in trabeculectomy have shown both groups to be equally successful,2–5,16 there has been concern over the increased rates of early postoperative bleb leak associated with fornix based flaps.8–15 This has been a reason for advocating the use of limbus based flaps in preference to fornix based flaps in trabeculectomy surgery. However the fornix based flap has the advantage of producing a better bleb morphology: it is more likely than the limbus based flap to give rise to a diffuse bleb with a normal vascular pattern rather than a cystic bleb.17 Wells et al have shown that in paediatric and young adult trabeculectomy with high doses of MMC, limbus based flaps may be more likely to develop serious bleb related complications such as late hypotony and bleb related infection, and may develop these earlier than fornix based flaps.18 They postulated that the higher rates of complications could be attributable to an increased risk of blebs from limbus based flaps developing cystic based morphology. The results of this study differ from those of the fluorouracil filtering surgery study (FFSS) in which early postoperative leakage was a risk factor for trabeculectomy failure.12 Several reasons may account for this. Firstly, the patients in the FFSS all underwent trabeculectomy with a limbal based conjunctival flap. Secondly, systematic bias is possible in the FFSS; the clinicians involved in assessing the eyes postoperatively were not validated with respect to their scoring of leaks. Thirdly, in the FFSS wound leak was not an independent significant predictor of trabeculectomy failure—when the number of previous procedures with conjunctival incisions entered into the statistical model, wound leak was no longer significant. The results of this study show that there is no adverse effect of early postoperative bleb leak on surgical outcome. Although limited to a single institution, the results of this study have general applicability because of the large numbers of surgeons involved and the lack of case selection. Clearly the study relates to early bleb leak only: a separate study would be required to address the impact of late bleb leaks. We would like to thank Professor Hitchings, Mr Miller, and Professor Khaw for permission to include their patients in this study. In addition we are greatly indebted to the many Residents and Fellows who participated in validation exercises and data collection for the study. Batterbury M, Wishart PK. Is high initial outlow of benefit in trabeculectomy? Eye 1993;7:109–12. Shuster JN, Krupin T, Kolker AE, et al. Limbus- v fornix-based conjunctival flap in trabeculectomy. A long-term randomized study. Arch Opthalmol 1984;102:361–2. Tezel G, Kolker AE, Becker B. Comparative results of combined procedures for glaucoma and cataract: II. Limbus-based versus fornix-based conjunctival flaps. Opthalmic Surg Lasers 1997;28:551–7. Lemon LC, Shin DH, Kim C, et al. Limbus-based vs fornix-based conjunctival flap in combined glaucoma and cataract surgery with adjunctive mitomycin C. Am J Ophthalmol 1998;125:340–5. Traverso CE, Tomey KF, Antonios S. Limbal- vs fornix-based conjunctival trabeculectomy flaps. Am J Ophthalmol 1987;104:28–32. Matsuda T, Tanihara H, Hangai M, et al. Surgical results and complications of trabeculectomy with intraoperative application of mitomycin C. Jpn J Ophthalmol 1996;40:526–32. Hafetz L, Keren T, Naveh N. Early and late postoperative application of 5-fluorouracil following trabeculectomy in refractory glaucoma. Ophthalmic Surg 1994;25:715–19. Ng PW, Yeung BY, Yick DW, et al. Fornix-based trabeculectomy with Wise’s suture technique in Chinese patients. Ophthalmology 2000;107:2310–13. Membrey WL, Poinoosawmy DP, Bunce C, et al. Glaucoma surgery with or without adjunctive antiproliferatives in normal tension glaucoma: 1 Intraoperative pressure control and complications. Br J Ophthalmol 2000;84:586–90. Beatty S, Potamitis T, Kheterpal S, et al. Trabeculectomy with augmented mitomycin C application under the scleral flap. Br J Ophthalmol 1998;82:397–430. Manners TD. Phacotrabeculectomy with “smile” incision, punch, and single releasable suture. Ophthalmic Surg Lasers 1998;29:570–4. Parrish RK, Schiffman JC, Feuer WJ, et al. Prognosis and risk factors for early postoperative wound leaks after trabeculectomy with and without 5-fluorouracil. Am J Ophthalmol 2001;132:633–40. Edmunds B, Thompson JR, Salmon JF. The National Survey of Trabeculectomy. III. Early and late complications. Eye 2002;16:297–303. Munden PM, Alward WL. Combined phacoemulsification, posterior chamber intraocular lens implantation, and trabeculectomy with mitomycin C. Am J Ophthalmol 1995;119:20–9. Austin MW, Wishart PK. Reformation of the anterior chamber following trabeculectomy. Ophthalmic Surg 1993;24:461–6. Grehn F, Mauthe S, Pfeiffer N. Limbus-based versus fornix-based conjunctival flap in filtering surgery. Int Ophthalmol 1989;13:139–43. Agbeja AM, Dutton GN. Conjunctival incisions for trabeculectomy and their relationship to the type of bleb formation—a preliminary study. Eye 1987;1:738–43. Wells AP, Cordiero MF, Bunce CV, Khaw PT. Cystic bleb formation and related complications in limbus-versus fornix-based conjunctival flaps in pediatric and young adult trabeculectomy with mitomycin C. Ophthalmol 2003;110:2192–7. None of the authors has any financial or commercial interests related to the manuscript. There was no financial support—public or private. Preliminary results were presented at ARVO. Does immediate postoperative aqueous leakage affect the final outcome of trabeculectomy? Ezra E, et al. Invest Ophthalmol Vis Sci 1995;36(Suppl):S21 [abstract 90].